In a food processor, pulse the flour with the sugar and salt. Pulse in the butter until it is the size of small peas. Sprinkle the egg mixture on top and pulse just until a dough forms. Scrape the pastry onto 2 sheets of plastic wrap and form into 2 disks. Wrap and refrigerate until chilled. Bring the milk to a simmer in a medium saucepan. In a medium bowl, whisk the sugar with 1 tablespoon of the cornstarch. Whisk in 1 egg and the salt. Gradually whisk in the hot milk, then return it to the saucepan and cook over moderate heat, whisking, until thickened and just beginning to bubble around the edges, about 4 minutes. Strain the custard into a bowl and let cool slightly. Whisk in 2 tablespoons of the butter. Using an electric mixer, beat the remaining 12 tablespoons of butter with the sliced almonds at medium-low speed until the almonds are slightly crushed. Beat in the confectioners' sugar and the remaining 2 tablespoons of cornstarch and 2 eggs, then beat in the custard and brandy. Preheat the oven to 350°. On a lightly floured surface, roll out each pastry disk to a 12-inch round 1/8 inch thick. Fit the pastry into two 9-inch fluted tart pans with removable bottoms. Fold the overhang onto itself. Using a sharp knife, trim off any excess pastry. Spoon the filling into the tarts. 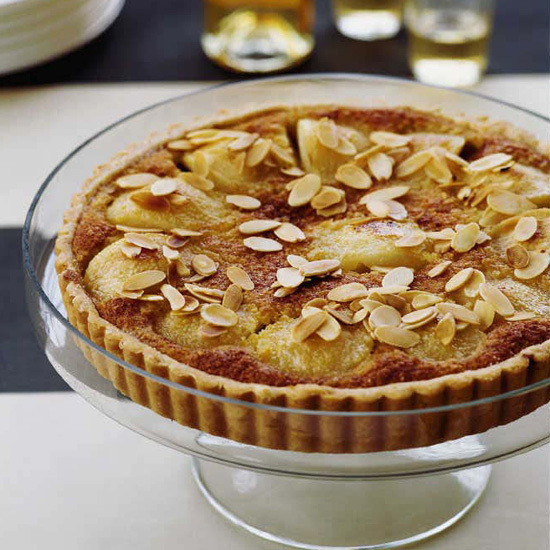 Place 1 pear quarter in the center of each tart; arrange the remaining quarters in a circle around it. Bake the tarts in the center of the oven for 1 hour and 10 minutes, or until the pears are very tender and the custard and pastry are deep golden. Let the tarts cool for 30 minutes, then unmold and serve warm or at room temperature with vanilla ice cream. The tarts can be stored overnight in airtight containers.